We all know the story: You walk into the pet store, but—to your greatest regret—it sees you. Behind the dreary glass of stacked terrariums, a beautiful Veiled Chameleon sits. You glance away, but that initial eye contact is undeniable. You are entranced. Before even meeting the lizard, you’re convinced it’s your best friend. How could you just walk away, leaving it miserable and alone, without a clue as to where it’ll end up? You couldn’t! So as simple as that, you arrive home with a new pet and no idea what you’ll do with it. Maybe you packed up an undersized aquarium for the meantime, but you know you’ve done a bad thing. The impulse buy creeps up on even the best of us. Once the claws have dug in, denying it’s requests can be gut-wrenching. But responsible pet owners keep their Veiled Chameleon’s housing at the ready, introducing occupants long after they’re perfected. This article is for anyone seeking the preemptive and planned path, as well as those who need all of the information they can get—and FAST! Veiled Chameleons are arboreal creatures, seeking refuge in the uppermost branches of the treetops. If you assume a tree dweller is equally content in a tall, spacious enclosure as it is in a small, squat fish tank: I have some news for you! Enclosures should never be viewed as containers; your pet will spend the majority of it’s life there. Create a habitat, home, and playground—not a cage. The minimal dimensions for adult male Veiled Chameleons are 24”(width), 24”(depth), 48”(height). Smaller females can be kept in 18”(width), 18”(depth), 36”(height) enclosures. When offering larger enclosures: horizontal space will be appreciated, but these tree huggers love height—prioritize it. A baby Veiled Chameleon can stay in smaller areas, because it makes eating, drinking, and basking less strenuous. However, if the young chameleon is healthy and monitored closely, adult-sized enclosures are fine. A screen enclosure’s superiority to glass was a long-standing assumption between chameleon keepers—but now, it’s a hot debate. Maintenance of your Veiled Chameleon’s habitat will differ depending on the cage it lives in, and mistakes happen in both screen and glass enclosures. You can avoid this with just a bit of education. So, what are the true differences between glass and screen enclosures? The main issue surrounding glass Veiled Chameleon cages is air flow, so minimal at times that it causes stagnation— noxious to any unlucky creature trapped inside. Conditions like this can result in respiratory problems and death for a Veiled Chameleon. But, fables tell of an open-aired savior: the screen enclosure. Screen eliminates the concern for stagnation completely. Does this really mean glass enclosures are totally unusable, though? No, using screen tops and small ventilation fans will push that stale air right out of your tank. Problem solved. For ventilation, screen enclosures are a blessing, but they can be a curse for humidity. Your home’s conditions will set the stage for the climate in your chameleon’s cage. To maintain an ideal micro-climate, you must be cognizant of your location. Screen is perfect in humid environments, but in arid areas, glass may be a better option. With less exposure to air outside the cage, it is easier to manipulate the humidity levels inside these little cubes. Glass has a habit of retaining the elements that enter it, while screen releases them. Heat is not an exception to this rule. Depending on your area, this can be a good thing or a bad thing. If your home is 72 to 75 degrees, a single lamp on a screen enclosure will suffice to meet your temperature range. Do the same thing with glass, and the enclosure may overheat. But in cooler climates, that extra heat is more advantage than liability. So, the battle between glass and screen is not as clean-cut as many people prefer to assume. Your decision should have a basis of climate: Think of the environment your home offers, compared to the environment a Veiled Chameleon requires. Which enclosure will make the conditions easiest to achieve? Don’t think commercial Veiled Chameleon habitats are suited for you? If you have ever thought, “I can make a cube as well as any manufacturer,” this section is for you. 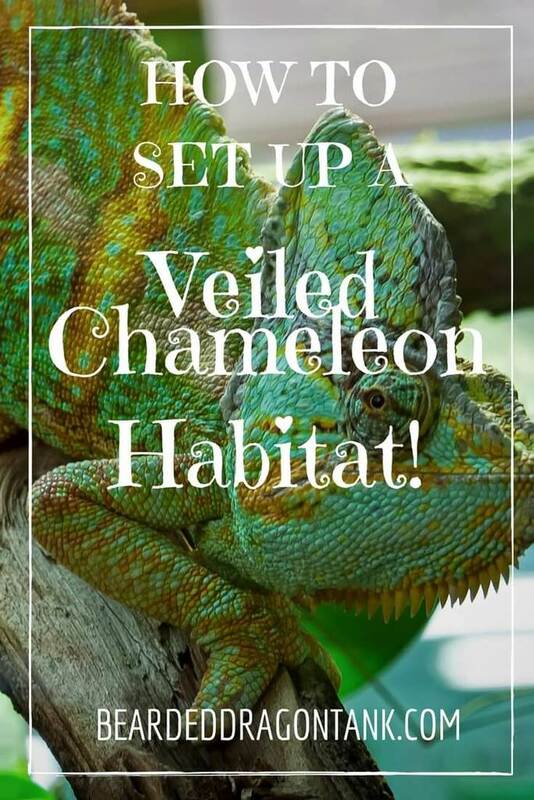 Custom Veiled Chameleon terrarium setups hold endless potentials; build an elaborate centerpiece for your living room, or a functional habitat to fit snugly into a corner. Instead of settling for sub-par or over-priced, pull out some tools and get creative! Before starting any project—regardless of the complexity—it is necessary to craft a solid plan: Map out your reptile’s needs, your budget, and your skill set. Make sure to consider the cleaning and maintenance of the cage. Then, calculate which materials are best used. Options that work on your side could just as easily turn against you. Wood can rot, plastic can melt, exposed screen risks injury, and glass is expensive and difficult to work with. 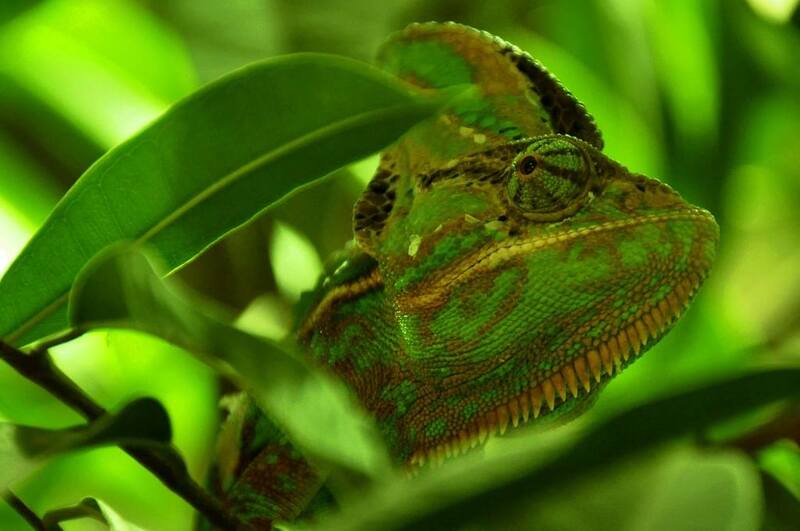 Be thoughtful, thorough, and cautious while building a custom Veiled Chameleon enclosure. Keeping your Veiled Chameleon comfortable is more than a matter of setup. Chameleons are notorious for stress sensitivity. Many sudden, unfortunate deaths have resulted from ignorance of chameleon behavior and psychology. 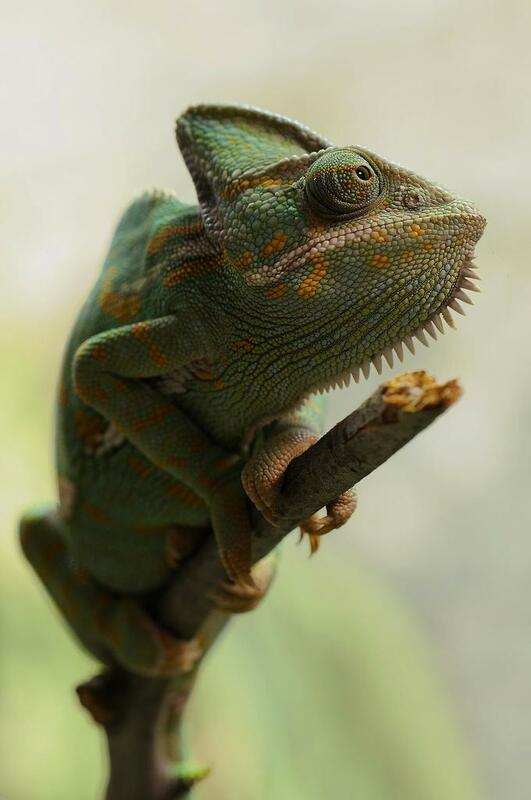 Nobody can read their chameleon’s mind, but behavior clues are obvious to those who look. Common signs of stress include pacing the cage, reduced appetite, a dark coloration (or stress marks), etc. Pinpointing the cause of these behaviors is, unfortunately, like playing a guessing game. Make changes to their environment, one after the other, until stress ceases. I suggest moving the cage to a quiet location, providing more shelter for hiding, and keeping other animal’s out of it’s view. A common stresser is rooted in the Veiled Chameleon’s natural solidarity. Never house multiple lizards in the same cage or within view of each other. Enduring the long-term stress of having no escape from an territorial opponent, will cause the decline of an other-wise healthy animal. Fighting, respiratory problems, and unexpected death are the consequences of forcing Veiled Chameleons to live communally. If you think you can’t survive without electricity, imagine what it is like to be physically dependent on the light bulbs hanging from your ceiling. This is the reality for our cold blooded pets. From calcium absorption to thermoregulation, the functions of a reptile’s body require a spectrum of lighting to work. An in-depth understanding of lights is essential to the success and well being of your Veiled Chameleon. So, what exactly is the difference between a regular light bulb and a bulb created specifically for our scaly friends? Ultraviolet-B (UVB) is present in sunlight from the wavelengths of 290(nm) to 315(nm), and almost all animals on earth have some level of exposure to it. Reptiles have a particular need for UVB, as the Vitamin D they absorb from the sun is converted into D3, which plays a crucial role in their bodies. In deficit of D3, calcium cannot be utilized in their systems. This causes the bones of your Veiled Chameleon to slowly deteriorate, becoming brittle and malformed. The painful and fatal condition is referred to as Metabolic Bone Disease(MBD). Though it is one of the leading killers in the reptile industry, MBD can easily be avoided. Veiled Chameleons are native to the Arabian Peninsula, living in sun drenched treetops. Since they’re exposed to more UVB than their friends on the forest floor, you may come to the conclusion that your pet should be under a high-output bulb. But, be mindful that they receive significantly less sun than desert dwellers. Studies have suggested that UVB can become harmful with overexposure: their life spans may even be shortened. To walk this tight-rope of reptilian lights, provide you Veiled Chameleon medium levels of UVB. Not all light bulbs are created equally. Though scientists have worked hard to develop high quality UVB bulbs for reptile enthusiasts, they’ve only made progression in florescent T5 and T8 bulbs. Almost all of the compact bulbs available offer little to no UVB output. Every major reptile care company sells a version of full spectrum lights. Selling between $10 and $20 per bulb, packaging claims to provide every form of light reptiles can use—heat, UVB, UVA, and more! But as we have already discussed, most compact bulbs are incapable of significant UVB output, and plenty of other heat sources exist. So where does the real worth of these bulbs lay? Maybe with the mysterious UVA. Ultraviolet-A does not contribute to the longevity of your Veiled Chameleon, but some say that reptiles detect a larger spectrum of lighting than humans can. Basically, a new field of color is unlocked when UVA, invisible to us, is present in a reptiles environment. Without it, vision may be impaired in a way similar to color-blindness. Are we neglecting the psychological well being of our Veiled Chameleons by not offering UVA? The importance of full spectrum lighting is still under skepticism, so I’ll leave you to make your own conclusions. Reptiles thermoregulate manually, moving from shade to sunlight as their body temperatures fluctuate. A temperature gradient (think cool on bottom and warm on top) is an immediate necessity in their cage. Ambient temperature is simple to control, but for a complete setup, your chameleon requires a basking spot (a monitored, hot surface) that will serve as it’s primary source of body warmth. A Veiled Chameleon’s enclosure should stay between 72 degrees and 80 degrees from top to bottom. At night, all lights should be switched off, allowing for 12 hours of darkness and slightly dropped temperatures. Keep a heat lamp on the top of your chameleon’s cage, a basking surface a few inches under it. It should be 95 degrees for adults; babies are safer in the high 80’s. To monitor the temperature, use a thermometer with a probe or an infrared temp gun. Cheap stick on thermometers are highly inaccurate. Now we dive into a critical aspect of Veiled Chameleon care that can make or break your budget: water systems and humidity control. But before that, ask yourself a few questions: How much time do you spend at home? How much money can you afford to spend? And (be truthful) exactly how forgetful are you? These questions are all relevant to deciding which water system is best for you. Simple and sweet, spray bottles are the go-to misters for a number of reptile keepers. An adequate spray bottle can be found for between $1 and $5 at any grocery store. Maybe you have one around your house already, as long as you do not expose your pet to harmful chemicals unintentionally. Alternatively, you can mist with a pressurized spray bottle. Besides saving you the effort of constantly pumping a trigger, they tend to create a finer mist than regular spray bottles. Being sprinkled with light, small particles of water may be preferable to your Veiled Chameleon than the hard drenching that regular bottles emit. Any local hardware or garden store should have pressurized water pumps available from between $10 and $30, or your local pet store may sell Exoterra Misters. I found a small garden sprayer in Dollar General for $4. Drop by drop, a dripper system provides water slowly throughout the day—if you couldn’t guess by the name. They keep a continuous supply of fresh water in the Veiled Chameleon’s cage, so between sprayings, the lizard won’t go thirsty. The most popular commercial dripper is The Big Dripper by Zoomed, coming with a closable top, a nozzle to adjust drip speed, and a tube to direct water where it is needed. It’s a handy product to own, but if the $10 is too steep for you, poke a hole in the bottom of a cup and place it on the roof of your cage: It creates a similar effect. Misting a chameleon’s cage two to four times a day is a giant responsibility. To those who’s schedules make it unachievable: consider purchasing an automatic misting system. The high price discourages most people, but the reliability and convenience is well worth the cost to many. How do you plan to mist when you leave town for a weekend? Arranging a chameleon sitter is not as simple as arranging a cat sitter. Still, most people agree that automated systems are not necessary for the average Veiled Chameleon owner. With a cost starting at $50 and scaling up to the hundreds, more than a little pocket change will go into this decision. With so much water entering your enclosure, it is only a matter of time before it overflows. Soaked carpets, rotting wood, and a general mess can be avoided with a small plan. New chameleon owners try to handle this conundrum with heap of towels and frustration. I propose we skip that phase and jump straight into a proper drainage system! Here is the breakdown: a cage that drains water instead of holding it, and a receptacle for the water that be dumped without hassle. Obviously, this is a pretty broad idea, so there are many different ways of doing drainage. This is where your own creativity will come into play. Consider the bottom of your cage. Is it PVC, screen, or solid? A solid floor will need holes drilled into it. To ensure the water actually makes it outside, drill strategically in places water will naturally end up. Your potted plant will most likely create a slight incline in the floor, which will cause water to roll towards its base. This is where drainage should be placed. However, when you’re making openings in the cage, don’t forget the creepy crawlers that will wander inside during your chameleon’s meals. If the holes are large enough for escapees, cover them with screen before releasing bugs inside. Leaving pools of water in the bottom of your enclosure will do more than make a mess. The floor of your cage is where the Veiled Chameleon’s waste is going to fall, so you can see how it becomes a breeding ground for nasty bacteria. And outside of hygienic reasons, it is best to keep feces in tact to be monitored regularly. Even if it isn’t pretty, chameleon poop is a window into your pet’s health. Plants are security and cover to your Veiled Chameleon, so the cage must be packed with them. They add humidity, double as a snack, and are just more natural and pleasant for a chameleon. Because, realistically, anything that lives, eats, and breaths trees knows when they’re plastic. Be smart when choosing plants, though. They need to be sturdy enough for the lizard to climb on, and will not die in high humidity. Make sure it is completely nontoxic, with organic, unfertilized soil. Lastly, the plants will thrive under your chameleon’s lighting, so don’t try setting the cage near a window. Regarding the substrate, many people simply do not use substrate for their tanks when it comes to Yemen Chameleons. They simply put their plants in a flower pot into the cage. However you can of course use substrate to create a beautiful looking habitat. Simple organic flower soil without fertilizer will do the job! A Veiled Chameleon’s cage can be simple or complicated, beautiful or basic—but it is the center of your pet’s well being. Envision the natural world and aim to recreate it, but remember the animal isn’t living in a pristine, self cleaning forest. It is an artificial habitat being controlled by you alone. Your chameleon’s comfort and happiness should be of top priority, but the convenience of maintenance will be a close second. To keep your pet in it’s best state, you must mix the perfect combination of light, warmth, water, and plant life. Once this is present, the bi-products need to be dealt with in a way that suits you best. You have rescued your new friend from the pet store; now it is time to create a home.